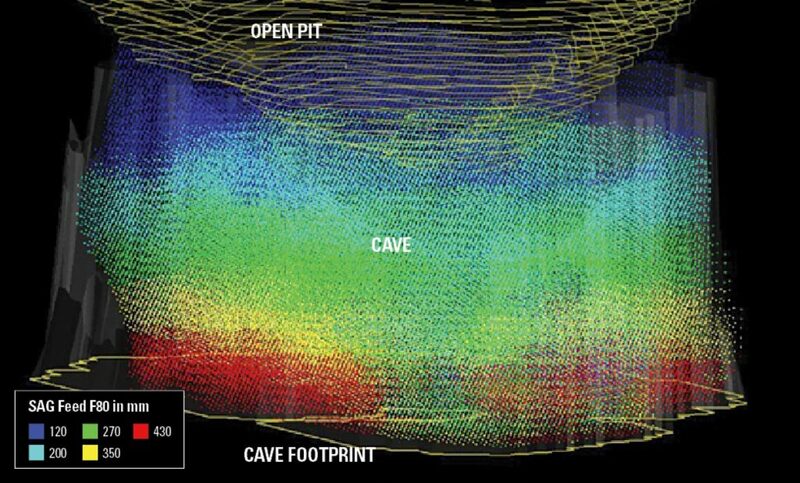 The advent of mass mining methods like block caving has introduced the term ‘cave-to-mill’, which considers the variability and uncertainty in fragmentation coming from each drawpoint. In the figure below, fragmentation estimates were made for each block in a potential caving zone underneath an existing open pit. To simulate the effect on SAG mill performance, these fragmentation curves were passed through a primary crusher model. As shown in the figure, the variation in mill feed (80% passing size, in mm) is evident as the cave propagates upward and the secondary fragmentation generates more fines and a smaller topsize. Between the cave and the mill, there may be limited potential for controlling fragmentation, ore blending, and/or stockpiling, and the plant front-end needs to be designed for fluctuations in hardness and feed size. In addition, unless mixing within the cave is well predicted and understood, geometallurgical knowledge of the orebody can be destroyed. While mass mining offers the potential to develop lower-grade underground deposits, the downstream effects on plant performance need to be carefully considered. Due to the potential for waste infiltration, pre-concentration or waste rejection opportunities ahead of grinding should also be included in any project study that considers mass mining methods.